A Living finish is a non-lacquered, unprotected finish that “changes” over time. The finish changes are caused by oxidation from air and water. Recent studies have shown that copper alloy surfaces kill E. coli O157:H7. Over 99.9% of E. coli microbes are killed after just 1–2 hours on copper. On stainless steel surfaces, the microbes can survive for weeks. ... Copper's antibacterial effect was found to be intrinsic in all of the copper alloys tested. Copper sinks are not difficult to maintain, but there are a few things you need to know. Copper reacts with acids, so run water when washing fruits such as lemons, limes, oranges, tomatoes etc. Mustard and vinegar can temporarily lighten the copper sink. Don’t worry. Leave the spot alone and “do not cover with wax” With use, the natural oxidation combination of air and water will darken the copper sink back naturally in no time at all. Our copper sinks are not sealed which makes the patina a "living finish". If you live in an area where the mineral content is high, we suggest you wipe the sink down with a clean soft cloth after every use. This will help avoid spots. All hand soaps should be free of any citrus, as this can cause spotting. We also recommend Renaissance Wax. This will protect your sink against mineral deposits and other types of build ups from occurring. You can apply a new coat of wax when you notice that the water is no longer “beading-up” on the surface of you copper sink. Copper is naturally antibacterial and will do most of the work in keeping itself clean. All you have to do to maintain the sink is give it an occasional cleaning with a soft soap such as Dawn liquid soap and a soft cloth. Gently wipe the interior and exterior with warm water and mild soap, rinse and dry with a soft clean lint free cloth. NEVER use any sort of abrasive cleanser, copper cleaner, or scrubber on the sink because it may scratch or even remove the patina. 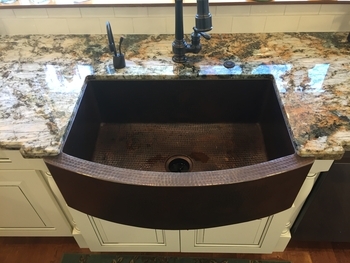 NOTE: if you have housecleaning done by another, you need to inform them of how to care for your copper sink, so that harsh or abrasive chemicals are not used to clean your sink.